the whole point in the G3 shell was that it's "task" oriented .. so different tasks types could be easily grouped together under their own workspaces .. then you'd use the keyboard to switch between groups. This seemed akin to where people say Windows is "easier" than Linux just because they're "used to" Windows and can't be bothered with a learning curve .. the G3 workspace switcher is "different" in fact it's that different that I can't be bothered with it either, but I won't call it stupid just because I haven't learned to use it, for all I know it could be the best thing since sliced bread once you get to grips with it. The funniest part of the video, to me, is the Bozo who made it. He needs Docky on G3 ? Really ? He obviously hasn't got a clue HOW to use G3. All he's doing is pointing out his stupidity. This review caught me off guard, and completely by surprise. Otherstuff has been very gracious to Peppermint --several times, in fact. And, really, I've never seen him say a mean word about any distro --ever-- until he reviewed Ubuntu's Gnome 3, and Ubuntu's Unity UI. Then, when Otherstuff reviews these two particular distributions, he seems to go from Dr. Jekyll to Mr. Hyde in a heartbeat. Those two particular distributions just hit him wrong. But, since we on the subject of Gnome 3, how is it? Does anyone around here like it at all? A while back, I remember doing an awful lot of clicking with Gnome 3 to get anything done. But, if anyone has anything good to say about Gnome 3, please do. There has to be somebody here who likes Gnome 3, or can a least rattle off a few of Gnome 3's virtues. I'll begin here: Gnome 3 does have a classic look and feel, and Retro can be very, very cool! These so called task/activity oriented DE's (which are really just "touchscreen/desktop convergence" DE's) are not for me .. I tried to like them but just couldn't. When Canonical came out with their whizz-bang Unity UI (which is actually just a Compiz plugin) I searched for a tool to customize it, and I couldn't find any better way then using Gnome Shell. At first, I hated Gnome3, like everyone else, but after a couple of years of using it I started preferring GS to Unity - so much so that I signed onto GS Staging with Jeremy Bicha at the helm. When Jeremy decided to move on, so did I (let's just leave it at that). Anyway, I've got a lot invested in GS - like it - and use it the majority of the time when testing Ubu code. That's why I find the video above so amusing. Anyone that *thinks* they're going to figure out Gnome3 in a few sessions is delusional. It took me a couple of years. I might also mention, G3/GS is a work in progress. Initially, they removed a lot of features that were present in Gnome2, which immediately pissed off their user base. GS and Unity have become better products for the changes though, IMO. 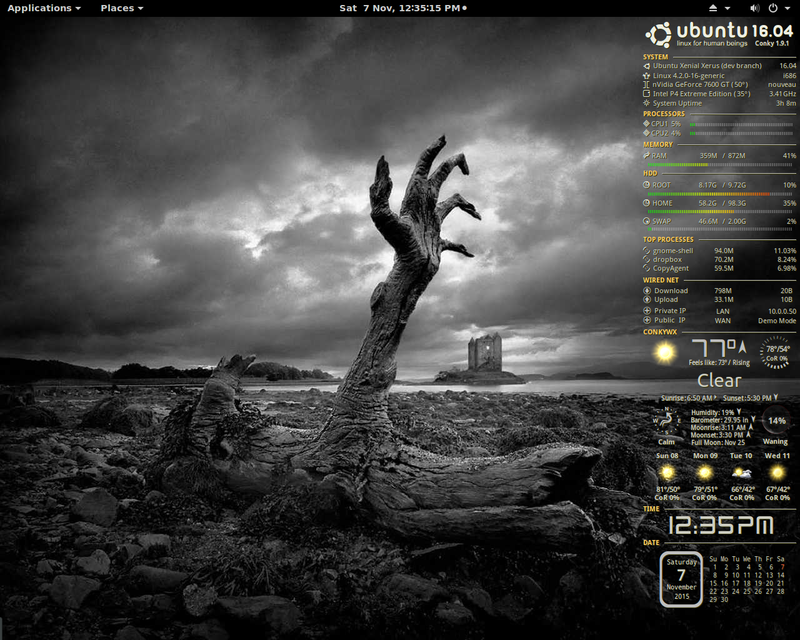 Here's a snappy of my GS desktop sitting idle - no trickery - 3 hr runtime. As you can see, it doesn't use a lot of resources these days, and the performance is acceptable on my ancient iron. How does it compare ? No contest. Peppermint flies like the wind on this machine, but G3/GS is head n' heels above Unity, in both handling and performance. I *really* should take another look at G3/GS as I've heard it's much improved from when it was released (and when I last tried it) .. but I just know I won't like it. That may say as much about me as G3 though. Everyone's entitled to an opinion .. but it oversteps the mark if you publicly get personal about the developers. By all means draw attention to perceived weaknesses (even though others will disagree), name calling is a step too far. Also it should be stated that no matter how much you dislike G3/GS .. a good chunk of what people generally consider "Desktop" Linux wouldn't exist if it weren't for the Gnome project (in fact I'll pretty much guarantee that he uses some of their libraries on his system, no matter which DE he prefers) .. they deserve respect even if you dislike the current Gnome DE. Hhmmm ... sounds like Veggie!?! Ubuntu 15.10 Gnome runs really well... but you all knew that anyway. Yes the interface is difference but its very usable - I suppose I should watch the video to see what he is griping about, but do I need to. As we all keep saying... its about choice, don't like it - move onto the next one. Criticism needs to be constructive and preferably with a solution to the problem or dislike you think you have found. It's funny you say this, because I've been watching Otherstuff's videos ever since he first reviewed Peppermint. And his absolute, favorite distro of all time is Ubuntu's MATE --which has to be using nearly everything from the GNOME project. So your point, PCNetSpec, in this particular case, might even be understated! Otherstuff has said, in one of his MATE videos, that anyone, from a beginner to an advanced user, need look any further than Ubuntu MATE. He also gives high marks to the LXDE desktop evnoronment --Peppermint's in particular. He also finds finds Manjaro's Fluxbox a very interesting project. And, finally, he finds the Xfce desktop good, but quirky and unnecessary, because of MATE. So, yeah, I'd say the GNOME project is foundational to Otherstuff's online life, and he wouldn't be using MATE without it. So, clever and colorful as Otherstuff may be, he may end up having to do a mea culpa on this one! Me? I'm getting lots of error messages with my installation of Ubuntu GNOME 15.10, but it does have a lot less bloat than Unity. Really, other than a gazillion error messages, I'm not finding it all that bad. And it's not nearly as nosy as Unity either. Still my biggest beef with Ubuntu GNOME is that I don't see that cute little Gnome footprint symbol anymore. I had liked knowing that little fellow had been around! After going about a year without looking at Ubuntu's MATE project, I'm now going to take another look on MATE. I guess I'm on a GNOME kick now. If I see any footprints over there, I'll know where that little fellow has gone! If you think of Gnome Shell as for a touchscreen tablet, and consider that on a tablet you're highly likely to run ONE application per desktop, their slide out "task switcher" makes a lot of sense (maybe less so as a "desktop switcher" on a traditional PC). That said, I'm not a fan of "convergence" desktops .. desktops and tablets have VERY different requirement .. IMHO a DE that's designed for both will always be a "jack of all trades, master of non" affair.